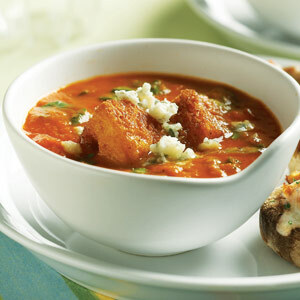 There’s nothing better than tomato soup on a chilly day. You could open a can, but after trying this recipe, you may never walk down the soup aisle again! Prewashed bagged spinach is a great convenience, but it’s a good idea to give the leaves a quick rinse before using to reduce the chance of any contamination. Bunch spinach always needs a thorough wash—it’s typically very sandy and gritty. Sweat shallots in oil in a large pot over medium heat until soft, about 5 minutes. Stir in garlic and pepper flakes; cook 1 minute. Deglaze pan with wine; simmer until nearly evaporated. Add tomatoes, broth, and basil. Increase heat to medium-high; bring mixture to a boil. Reduce heat to medium-low and simmer soup for 10 minutes. Purée soup with a hand blender (or in batches in a standard blender) until smooth. Return soup to the pot and bring it to a simmer. Stir in sugar and vinegar. Just before serving, stir in spinach; season with salt and pepper. Garnish soup with croutons and blue cheese. Include the juice from the can. It will boost the soup’s flavor. Lightly crush tomatoes with a spoon. After puréeing, finish the soup with spinach. “Florentine” simply means that spinach is in the recipe. This recipe takes the "orange cheese and white bread" grilled cheese sandwich up several notches!